The architecture social calendar in New York includes a bewildering array of benefits, parties, fundraisers, and charity auctions. But the yearly event that brings out the most party loving architects is the Storefront for Art and Architecture's benefit and art auction. 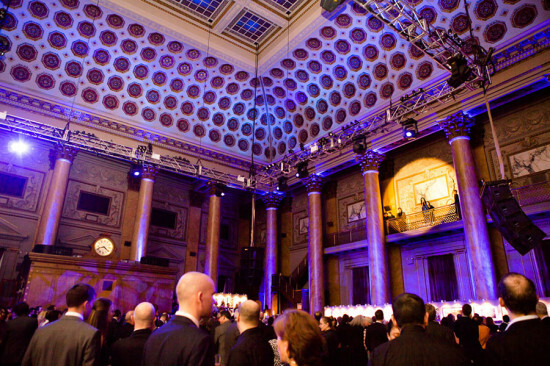 The Storefront always gets the most fabulous venues for its events and this year's was beyond spectacular: the 1893 Bowery Savings Bank. Designed by Stanford White of McKim, Mead and White the space takes up a huge through block site between the Bowery, Grand, and Elizabeth streets. The interior is a riot of colorful Siena marble walls, mosaic floors, faux marble scagliola columns, coffered ceilings, and stairs and skylights made of cast iron. This nearly indescribable landmark was the perfect venue for Storefront's grand director Eva Franch and even more grand board president Charles Renfro to introduce the gala's honored guests Olafur Eliasson and the composer, vocalist, and choreographer Meredith Monk. They appeared on a high balcony and spotlight like opera stars, talked about the importance of the Storefront to the arts community in the city and asked everyone to bid aggressively on the art works in the auction. Robert M. Rubin, Storefront board member, bid on a small Louis Kahn sketch. Other works by Ann Hamilton, Kiki Smith, Terence Gower, and Denise Scott Brown all sold to eager buyers. Bernard Tschumi, who donated a print from his Manhattan Transcript series, also bid on and, with his wife Kate Linker, gazumped all other bidders to take away a magical Meredith Monk print of a musical score. The event bought in a total of $344,370 to the Storefront. 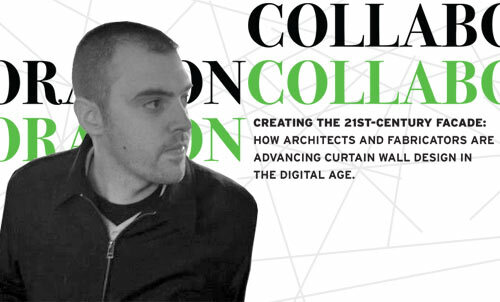 On February 17, David Fano will lead Revit Design, a workshop exploring the possibilities of the digital design program Revit, as part of DAY 2 of COLLABORATION, a conference on fabrication and facades sponsored by The Architect's Newspaper. In 2008, David Fano established CASE Design, a Building Information Modeling (BIM) consultancy in New York. Prior to CASE, Fano was Director of Technology Research at SHoP Architects, where he managed technology R&D initiatives, worked with project teams to ensure the successful implementation of BIM, and developed “direct to fabrication” initiatives with software manufacturers and fabricators through the use of BIM. He contributed technology expertise on numerous projects, including for a 41-story rental tower in New York City and for The New Seaport, an 860,000-square-feet multi-use development in New York City’s Historic Seaport District. Since 2006, David has been an Adjunct Professor at Columbia University’s Graduate School of Architecture, Planning, and Preservation where he teaches seminars and workshops focusing on the impact of technology on design processes. David received his Master of Architecture with honors from Columbia University where he was the recipient of the Lucille Smyser Lowenfish Memorial Prize and the Computer Aided Design Honor Award. On February 17, David will present the day-long workshop, Revit Design, building from fundamental Revit design concepts to advanced techniques concentrating on how the formal and organizational potentials emerge from informational modeling. Register here.